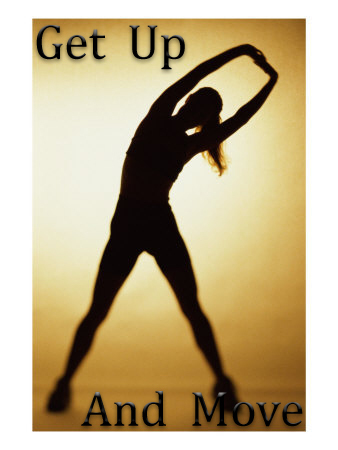 Get Up and Move Challenge Day 28: Is being flexible important? In the realm of exercise, aerobic and resistance training usually take center stage. As they should, being that they provide the main health benefits of exercise. Flexibility often gets tossed out the window and forgotten with most people, however, as we age, working on our flexibility becomes more and more important. Stretching exercises can help to improve a joint's range of motion as well as physical function . Right now you may think this doesn't matter. Right now you may be able to reach up over your head and pull down a set of heavy mixing bowls, or bend over to place items in the dishwasher. The older we get unfortunately, the harder and harder these seemingly simple tasks become to do. Not only do these tasks get harder, but the risk of falling (with the possibility of fracturing a hip) increases as well. Over 81% of deaths from falls are in the 65 and older population, and those 75 and older who fall have a 4-5 time higher risk of ending up in a long term care facility for a year or longer . On top of that, those who sustain a hip fracture during a fall have a 20-25% increased risk of death. So, maybe flexibility and balance are more important than we first thought. Static stretching involves a passive relaxation of the muscle while it is elongated (such as reaching to touch your toes and holding the position). It is recommended to hold each type of this stretch for 15-60 seconds. Dynamic stretching is commonly used prior to training or maximal events. This method involves a smooth swinging or continual motion of the muscle, stretching a little farther with each motion (stretch is not held). Ballistic stretching involves a bouncing or bobbing movement and is not commonly recommended. PNF technique involves passively stretching a muscle, then contracting the muscle in that position for about 6 seconds, relaxed, then moved farther into the stretch and held for about 10-30 seconds. It is not recommended that those unfamiliar with this technique and without supervision use this method. It is important to note that regardless of the type of stretching you perform, they should be within the limits of discomfort in your range of motion, but no further. A stretching workout should be performed for at least 10 minutes, 2-3 days per week. These sessions should involve the major muscle tendons with four or more repetitions. Workouts such as yoga and tai chi are also great programs to enhance flexibility and balance. American College of Sports Medicine. Resource Manual for Guidelines for Exercise Testing and Prescription. Philadelphia, PA: Lippincott Williams and Wilkins, 2010. American College of Sports Medicine. Guidelines for Exercise Testing and Prescription. Philadelphia, PA: Lippincott Williams and Wilkins, 2010.